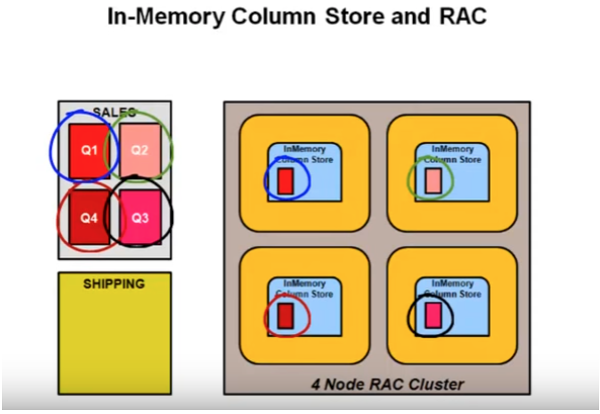 In-Memory column store (IM column store) is an optional area of the System Global Area (SGA) that stores copies of tables, partitions, and other database objects in a columnar format that's optimized for rapid scans. IM column store accelerates database performance of analytics, data warehousing, and online transaction processing (OLTP) applications. IM column store stores copies of database objects in the SGA. It doesn't replace the database buffer cache. Both memory areas can store the same data in different formats. Rows stored in the IM column store are divided into large memory regions in a columnar format. A column resides separately in a contiguous area of memory within each region. You can either store all of a table's columns in the IM column store, or just a subset of them. Similarly, for a partitioned table, you can either store all of the table's partitions, or only a subset of them. If you enable the IM column store at the tablespace level, Oracle Database automatically enables all of the tables and materialized views in the tablespaces for the IM column store. IM column store also enhances the performance of data manipulation language (DML) statements. OLTP systems typically require many indexes to be created on commonly-accessed columns. These indexes might have a negative impact on the performance of DML statements. Storing a database object in the IM column store makes these indexes unnecessary because scans run much faster. Eliminating the unnecessary indexes improves the performance of DML statements because fewer indexes have to be updated. After you determine the memory required to store database objects in the IM column store, you can set its size by using the INMEMORY_SIZE initialization parameter. The default value for this parameter is 0, which means that the IM column store is not used. To enable the IM column store, set this parameter to a nonzero value. In a multitenant environment, you can specify the size of the IM column store for each pluggable database (PDB) by setting this parameter per PDB. The sum of the values for the PDBs does not have to equal the value for the container database (CDB), and may be greater than it. After you set the size of the IM column store, you have to restart your database instance to enable it to store the database objects. The SQL Monitor Report, Active Session History (ASH) Report, and Automatic Workload Repository (AWR) Report now show statistics for various in-memory operations. By default, Oracle Database uses the default database caching mode when it performs full table scans. If the Oracle Database instance determines that there's enough space to cache the full database in the buffer cache and that it's beneficial to do so, then the instance automatically caches the full database in the buffer cache. Smaller tables that are less than two percent of the buffer cache size: Loads these tables into memory. Medium-sized tables: Analyzes the interval between the last table scan and the aging timestamp of the buffer cache. If the size of the table that was reused in the last table scan is greater than the remaining buffer cache size, caches the table. Large tables: Does not load these into memory unless you explicitly declare the table for the KEEP buffer pool. Force full database caching mode enables you to cache the entire database in memory, which might provide substantial performance improvements when performing full table scans or accessing large objects (LOBs). In default caching mode, Oracle Database doesn't always cache the underlying data when a user queries a large table. In force full database caching mode, Oracle Database assumes that the buffer cache is large enough to cache the full database and tries to cache all of the blocks that queries access. It succeeds when the size of the database is smaller than the database buffer cache size. Oracle Database loads all data files into the buffer cache as they're accessed, including NOCACHE LOBs and LOBs that use Oracle Database SecureFiles. Image source: Full DB In-Memory Caching. The logical database size (or actual used space) is smaller than the individual buffer cache of each database instance in an Oracle Real Application Clusters (RAC) environment. This recommendation also applies to non-Oracle RAC databases. The logical database size is smaller than 80% of the combined buffer cache sizes of all of the database instances for well-partitioned workloads (by instance access) in an Oracle RAC environment. The database uses SGA_TARGET or MEMORY_TARGET. The NOCACHE LOBs need to be cached. The NOCACHE LOBs are never cached unless force full database caching is used. In the first three situations, you should monitor system performance periodically to verify that the performance indicators meet your expectations. Note: When one Oracle RAC database instance uses force full database caching mode, then all of the other database instances in the Oracle RAC environment also use this mode. In a multitenant environment, force full database caching mode applies to the entire CDB, including all of its PDBs. The output is either YES or NO. In summary, IM column store reduces the execution time for DML statements, and force full database caching mode offers significant performance improvements. For more information on Oracle Database's new performance-tuning features, check out the reports that Oracle Enterprise Manager (OEM) provides.